The HTC One is HTC's new flagship phone, featuring a ultra-sharp 4.7" 1080p full HD display, a quad-core 1.7GHz Qualcomm Snapdragon 600 CPU, 2GB of RAM plus 32GB or 64GB of non-expandable flash storage. The primary camera is reportedly a 4 megapixel unit.. yes, 4 megapixels.. with a 2.1 megapixel one on the front for video calling. The camera requires some explanation - HTC have gone for quality rather than quantity with the sensors, and say that they capture 300% more light than a traditional smartphone sensor. When high megapixel cameras are becoming the norm on devices like this, it is pretty brave for HTC to play a different game.. but on many cameras, more megapixels simply means bigger pictures rather than higher quality ones. It is worth noting that the Nokia 808 PureView takes a roughly similar approach by using oversampling instead. The camera is capable of taking full 360 degree panoramic pictures, it has 1080p HD video recording, time sequencing and object removal plus a wide-angle lens on the front for video calling. The HTC One has a feature with the daft name of HTC Zoe which takes a three-second video clip that makes photo galleries a lot more interesting. The 4.7" display has a pixel density of 468 ppi which pretty much blows everything else out of the water, including the iPhone 5 and the recently announced LG Optimus G Pro. The resolution is 1080 x 1920 pixels, and the HTC One can output via an HDMI adaptor to a big screen TV, allowing you to play back captured video or downloaded content. This is an Android 4.1 device with a new version of HTC Sense on top, including HTC BlinkFeed which changes the homescreen into a feed of updates, news and entertainment snippets, which is a lot more interesting than the stock Android screen. HTC Sense TV will also allow the HTC One to control certain home TV systems and comes with its own programme guide. Audio playback is enhanced with HTC BoomSound and Beats Audio, which should make the HTC One a very entertaining device when you take into account the high-resolution display and powerful CPU. 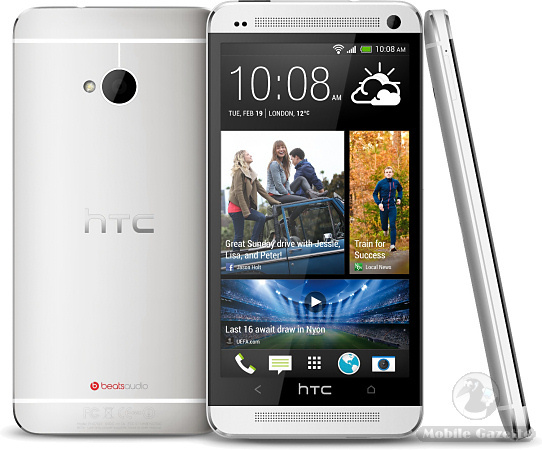 The HTC One features NFC, Bluetooth 4, WiFi and 3.5G support. Some countries will have LTE support, and the One features GLONASS as well as GPS positioning systems. It is housed in a very attractive aluminium unibody design and it weighs 143 grams and measures 137 x 68 x 9.4mm. Inside is a 2300 mAh non-removable battery. HTC say that the One will be available on 185 carriers in 80 countries worldwide starting in March, including most carriers in Europe (including the CIS), North America and China.. but one notable omission from HTC's list is India. 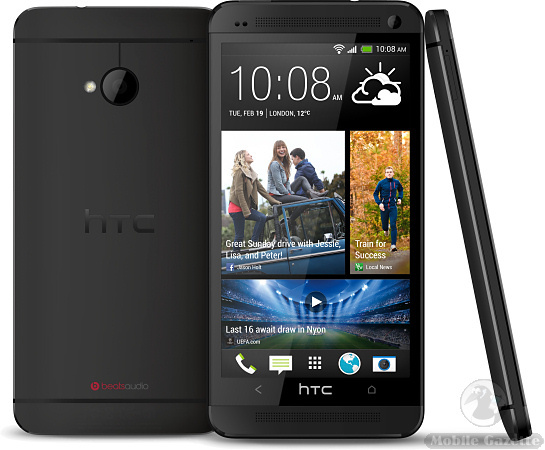 In the UK, the HTC One will be free on certain £36/month contracts from Phones 4U or £69.99 on a £41/month contract from EE (which includes support for 4G data). This is a very attractive and very powerful device that has several unique features that make it very desirable. HTC have been struggling in the market recently, but the HTC One is extremely impressive and should give rivals a run for their money.